June 6, 2015 June 13, 2015 / Steve M.
Every activity has to start somewhere and for me, my craze for collecting is very closely associated with the bookcase in which my Olympia’s are currently housed, this is the largest of the two cases for which there are images on the site. Before I get to the role of the bookcase, I am inclined to make you suffer a brief history of me. I begin at age 4, in 1959, as I have no reliable memory prior to that, I do recall being lost, unsupervised and terrified prior to that presumably somewhere in Bournemouth, where we lived until I was 4, then moving to Whitstable, where life for me began. Until that point I had believed that my father was a handsome sailor, complete with Royal Navy uniform, very young with blonde wavy hair, he used to come home on leave, bringing exotic gifts from far flung locations, I particularly remember a tin Military Police Jeep battery operated that could do all sorts of amazing things. This handsome young chap turned out to be my eldest brother (actually step-brother) But that’s another story………. My real Father, who according to all was mysteriously absent for the first years of my life, was also in the navy, but the Merchant variety, where he was as he chose to call himself a chef, the reality of this was somewhat less glamorous, as he functioned as a galley cook on small coasters, plying between Whitstable and Esjberg in Denmark. So at the age of 4 I discovered myself to be the son of a sea cook, which in some places, I understand is a form of insult. Having lived in a small flat in a terraced house in Whitstable for a number of years, we moved up market to the nearby village of Tankerton where we had a much bigger ground floor flat, the rest of the house occupied by a large family, Italian in origin and temperament, with a Grandfather, the patriarch, who spoke much Italian and not much English, and his 3 rather crazy teenage grandsons who took great delight in frightening me, but that too is another story….. So in around 1963, we moved again, only about 500 yards up the road from the Italian contingent, this time to our own house, which my parents had somehow got a mortgage for. The previous occupants had thoughtfully left behind some items of furniture, a desk, a large oak dining table which turned out to be a half sized slate bedded snooker table, and yes you guessed a bookcase. My initial interest for a year or so focused on the desk , because, my father, a man with a very sweet tooth, used to hide his sweet stash in it, when I eventually found a way to fiddle the lock to gain access to the nut crunch and chocolate, i found a much more interesting item in the shape of a small automatic pistol, never did find the ammo but not for the want of trying, but that as they say is another story…. 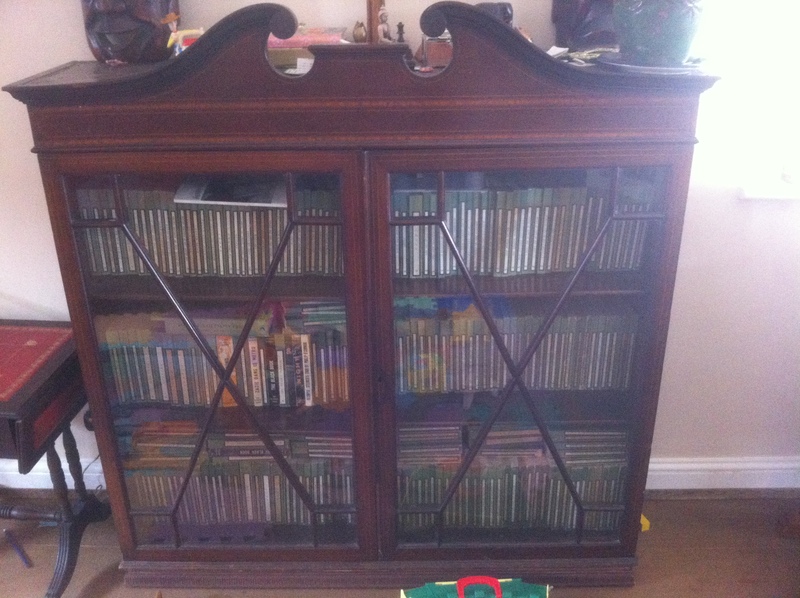 Aged 8 I became the proud owner of the bookcase, which my father proceeded to fill with books bought by the yard from a local junk shop, various boys adventure albums, “50 Events that Amazed The World” and the like along with the Complete works of Charles Dickens, all great stuff and I suspect not terribly expensive. 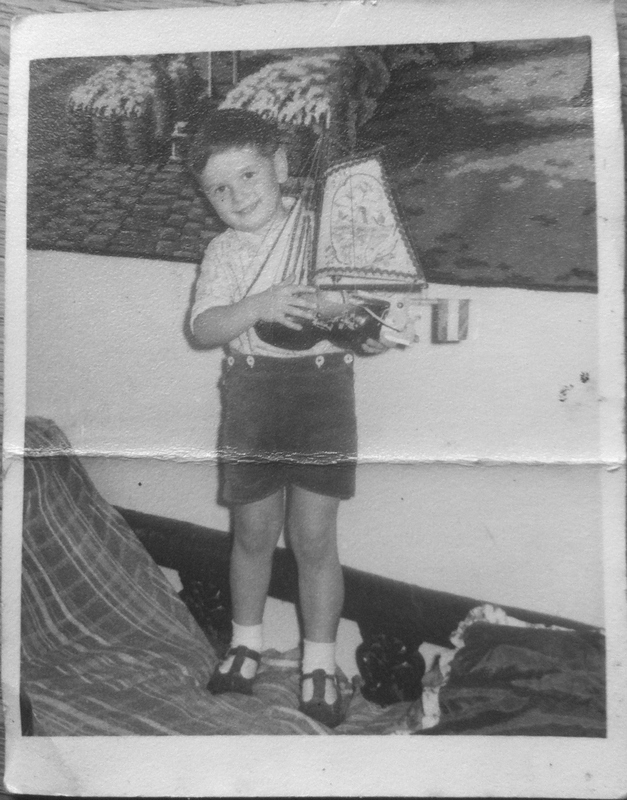 From this period of my life, and now aged 60, I have only 2 photographs, one of me as a baby and another aged about 4, inexplicably standing in front of a tapestry of the Sphinx, holding a lamp shaped from a Dutch clog in the form of a sail boat. The only other things I have are the desk (minus sweets and pistol), and the bookcase. ← The collection in its latest state.